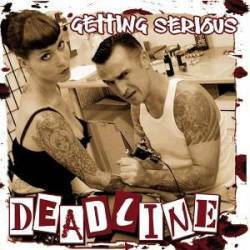 The album cover showing a tattooed rockabilly lady getting one more tattoo made me think that Deadline would be a rock'n'roll or oi punk band, but my preconception luckily was wrong. The third album by the London based band is one of the finest pop punk albums I've heard recently. Singer Liz has a warm and harmonic voice with a strong pop appeal that often reminds me of a very young Kim Wilde. The songwriting is another strong point on this album. Without neglecting their punk roots, Deadline write beautiful songs with sweet melodies. To name favourite tracks is quite hard, but I'll try The World Keeps Turning, Wave You Goodbye and Taken For A Ride. The songs are quite simple, yet very entertaining. Although melodies play a very important part on the record, there are still some straighter and faster punk tracks like Long Way Home or Nice Guy. Singer Liz is playing sax on some songs, giving them a slight ska touch. The album is unfortunately running for only about 36 minutes, never allowing the band to find boring moments, but also disappointing that the fun is already over.